Please excuse this pseudo post for I am tired and do not have anything of substance in me tonight. I’ve started using my Tumblr account, I think I’ve figured out where it fits for me, it’s Twitpic and Facebook sharing and the stuff that ends up spread over multiple tweets all bundled in together in the one spot. Or something. Anyhoo, I’m mimbles there too. 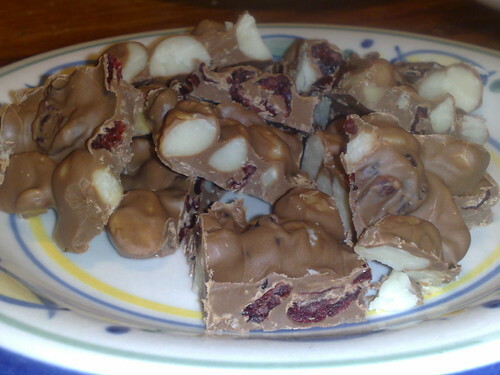 Remember the cranberry and macadamia chocolate I made on Friday that I said wasn’t very photogenic? I lied. Once it was cut up it photographed just fine. No, you can’t have any, we ate it all. 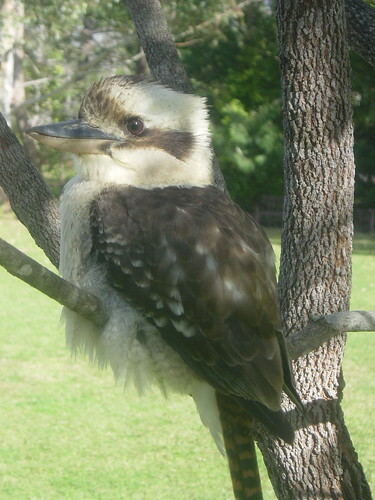 And in conclusion, I’d like to say – aren’t kookaburras awesome? They always look like untidy kotare to me. The species are closely related. I love kookaburra; their outrageous call always makes me laugh. Every now and then, we get one carousing away in the pine tree in our backyard, just 4km from the centre of Adelaide.